Note: The abbreviation AA following the name indicates that the individual is African-American. 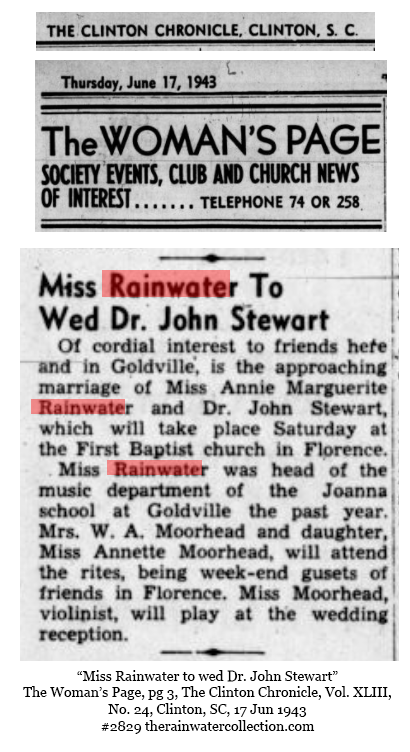 Thanks to Glidie Rainwater Mobley for the contribution of numerous marriage records, the result of many decades of research. If a number in the form #mf12345 is given in the record, this is the LDS microfilm number from which the record was transcribed. Most of these records are from mf#0409834. Some are also recorded in Fulton Co. 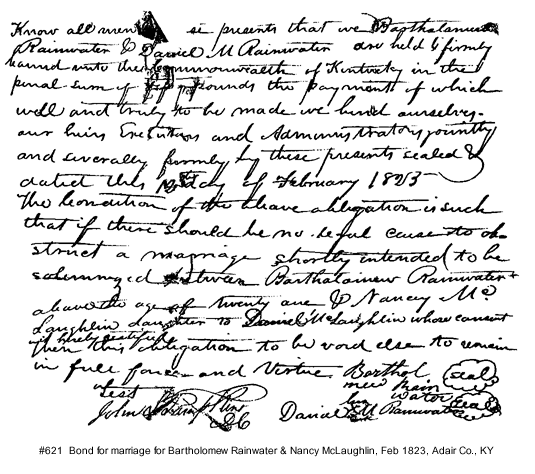 The following marriages are traditionally given as occurring in Campbell County, but this assertion is not supported by currently available documentary evidence. From mf #409838-409839; some of these marriages are also registered in Milton Co. or Campbell Co.
From mf #409838. Milton County went bankrupt during the Depression and was absorbed into Fulton County in 1932, which county now holds these records. 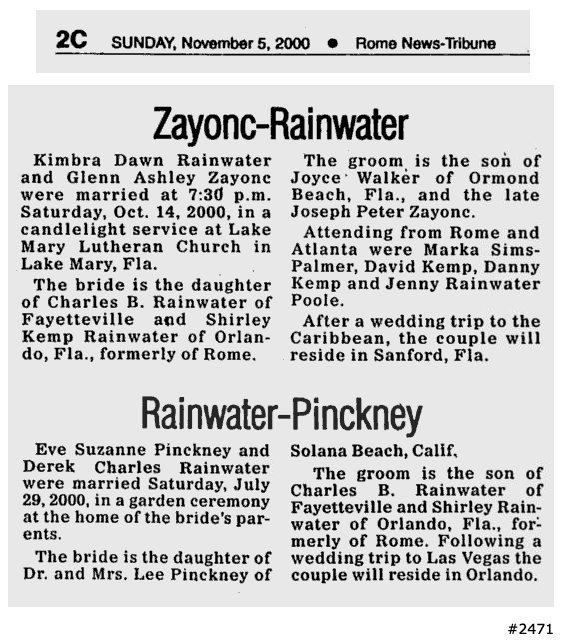 This marriage was reported in The Rainwater Researcher as having taken place in Polk County. However, when Michelle Ganus Taggart requested a copy of the record from the county courthouse and discovered that the marriage is not recorded there. The couple may have lived in Polk County, but must have been married elsewhere. Mike Denis notes that "marriage records, as well as birth and death records in New England are kept by the town. The county only keeps probate and deed records." Note: The transcription of the marriage records for this county lists Jacob’s surname as Role. 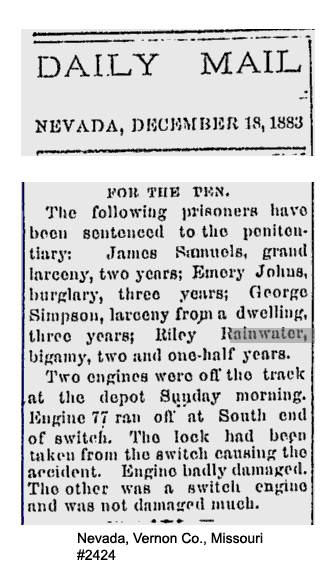 However, Glidie Rainwater Mobley indicates that based on the 1853 Mississippi census, the correct spelling is Roie. In older records, South Carolina's counties are called Districts. 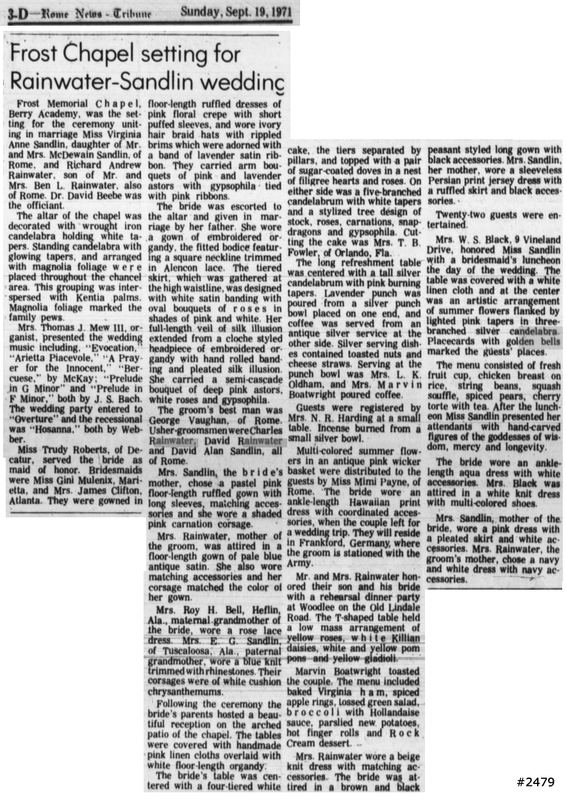 Original research provided by Marcia Schutza. 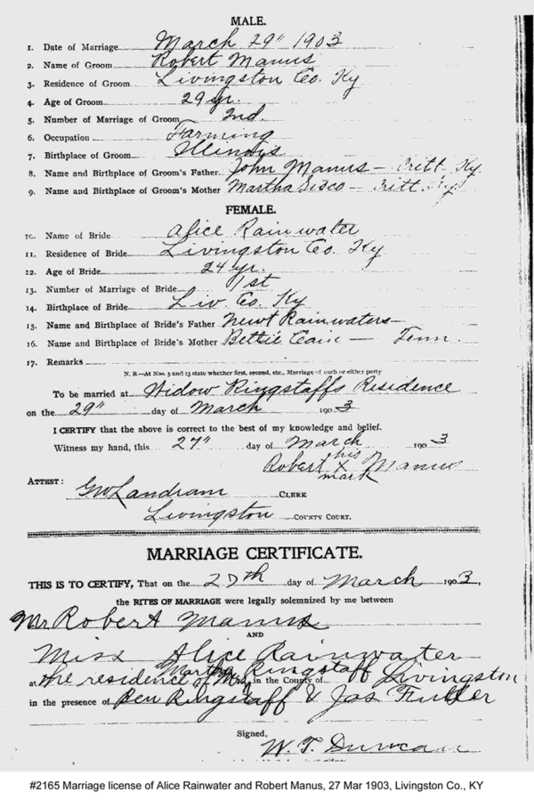 Information given in parentheses is not part of the marriage record, but from Marcia’s own research. 174: The Rainwater Researcher newsletter, various issues, 1994-1999. Quality of material is uneaven - requires 2nd confirmation. 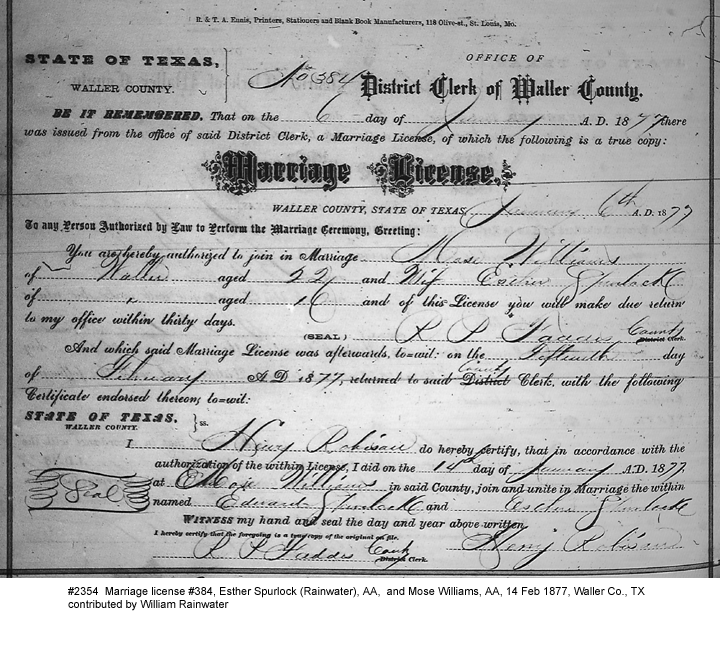 197: Early Marriages of Casey Co., KY, 1807-1915, Phillip A. Rice, et.al. 833: Some Georgia County Records, Vol. 4, Rev. 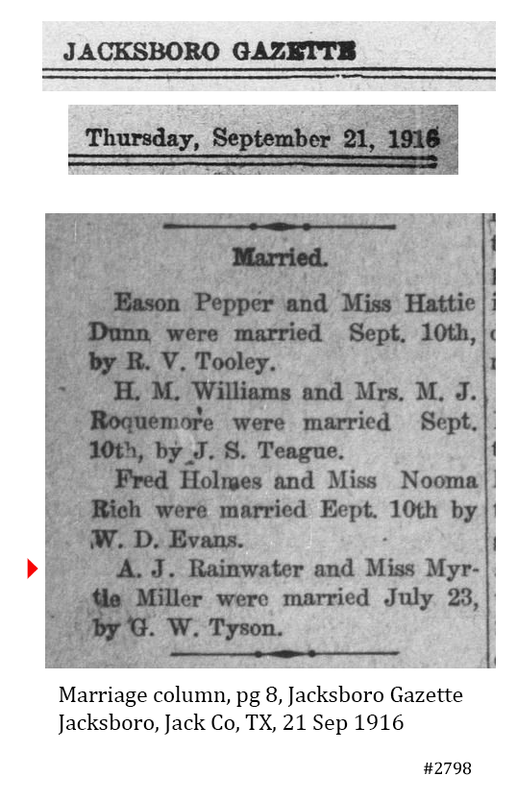 Silas Emmett Lucas, Jr.
845: Marriages from Early Tennessee Newspapers, 1794-1851, Rev. 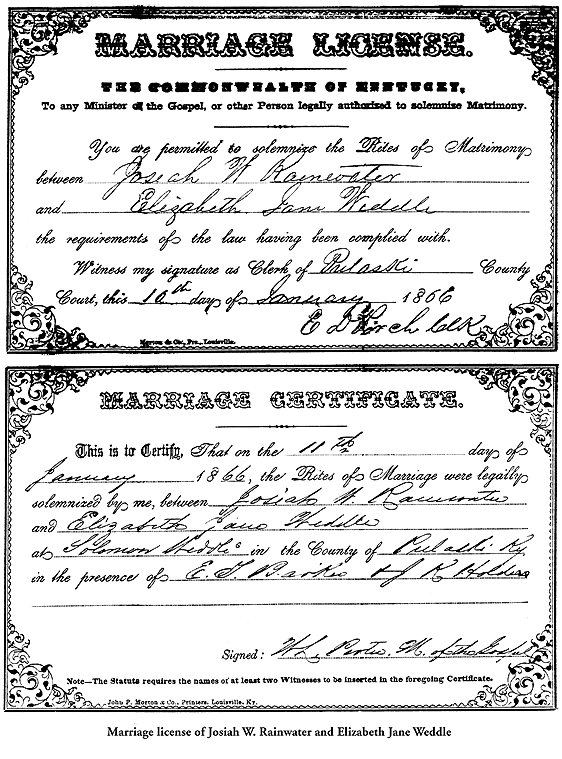 Silas Emmett Lucas Jr.
852: Marriage and Death Notices from Pendleton (SC) Messenger, 1807-1851, Rev. 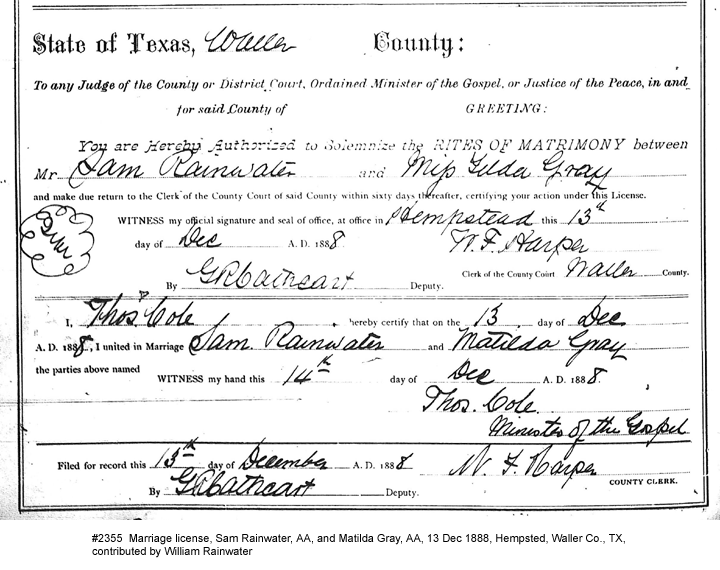 Silas Emmett Lucas, Jr.
917: Ray Co., MO Marriages, Ancestry.com database. Original sources: Dodd, Jordan. Missouri Marriages, 1851-1900. Orem, UT: Liahona Research, 2000. 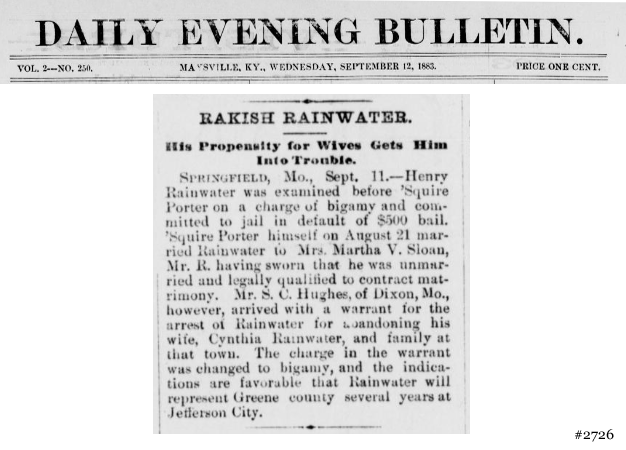 Taken from: Ray County, Missouri Marriage Register, 1851-1900 County Court Records located at Richmond, Missouri or Family History Library microfilm # 0959300, 0959722-0959723. 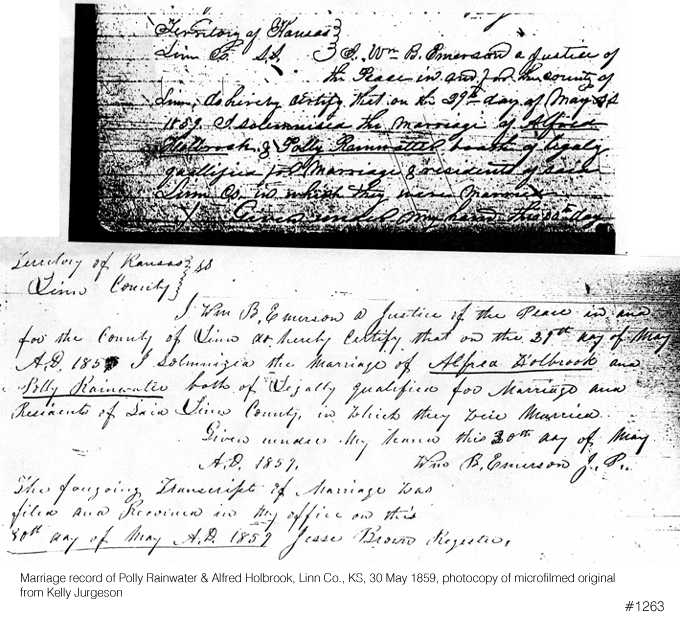 1273: Lincoln Co., KY Records, Vol. 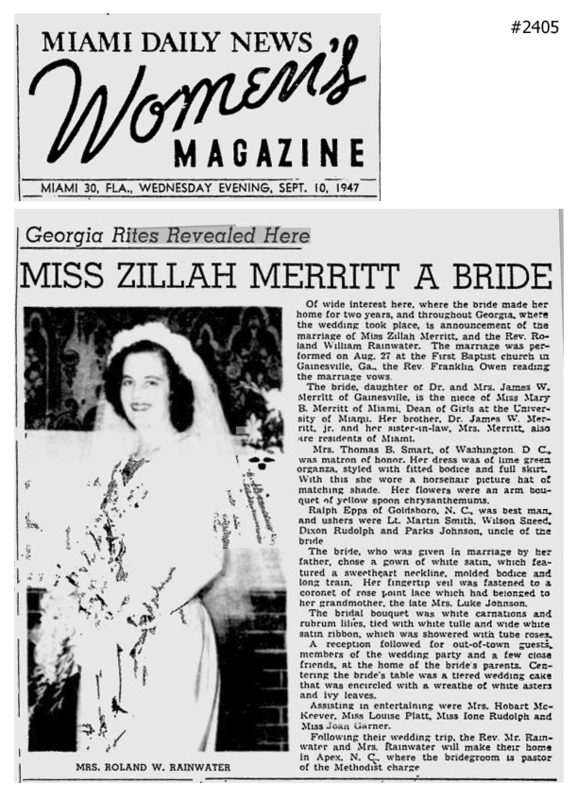 1, Michael L. Cook, C. G.
2405: "Georgia rites revealed here: Miss Zillah Merritt a bride", Women's Magazine, Miami Daily News, Miami, FL, 10 Sep 1947, scan of original. 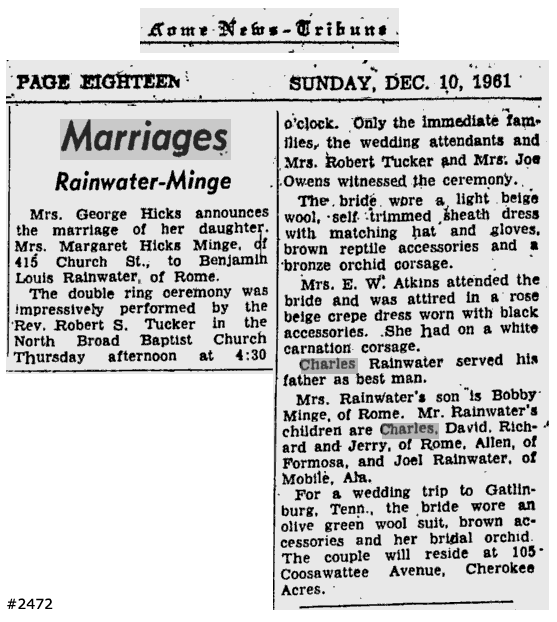 Announces the marriage of Roland W. Rainwater, Jr. to Zillah Merritt. 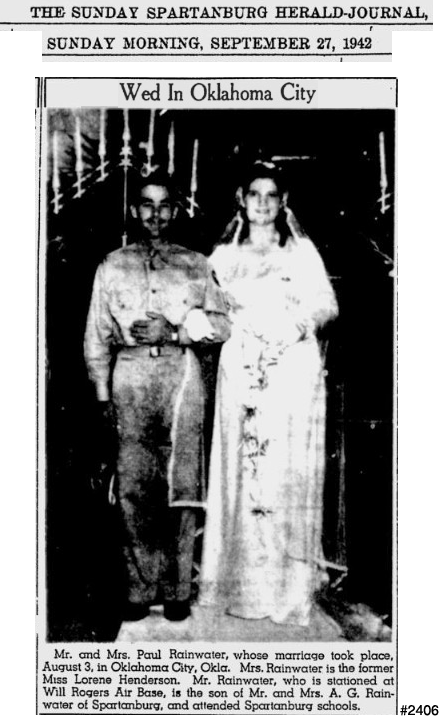 2406: "Wed in Oklahoma City", The Sunday Spartanburg Herald-Journal, Spartanburg, SC, 27 Sep 1942, scan of original. Announces the wedding of Paul Rainwater to Lorene Henderson. 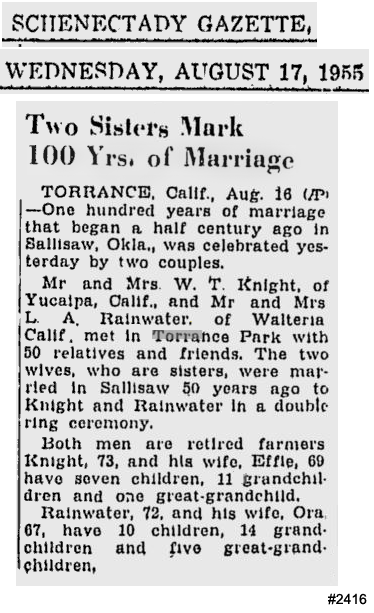 2416: "Two sisters mark 100 years of marriage", Schenectady Gazette, Schenectady, NY, 17 Aug 1955, scan of original. 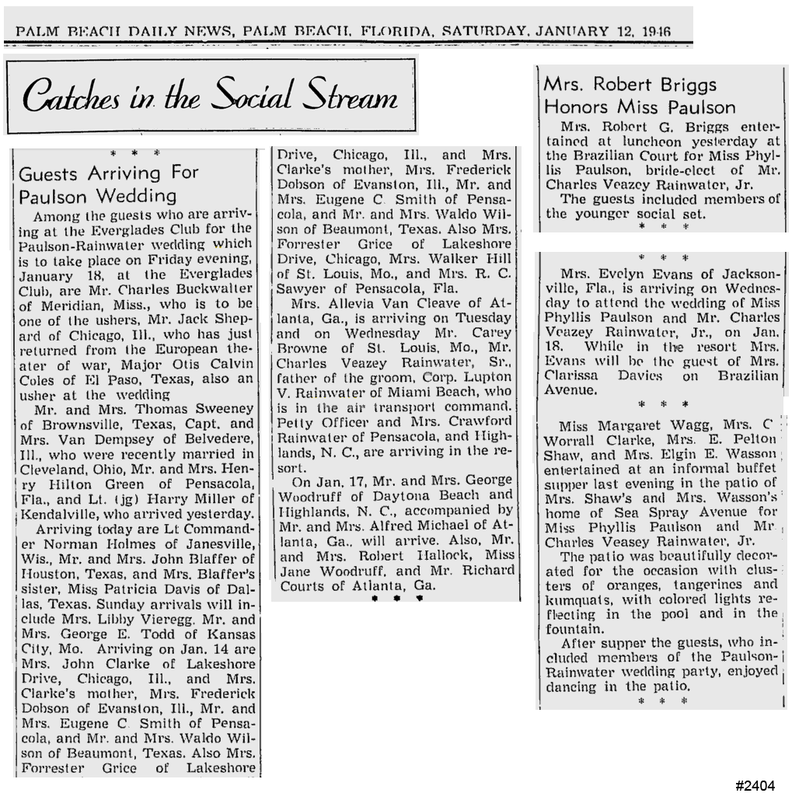 Subject of article is the marriages of Lafayette & Ora Rainwater. 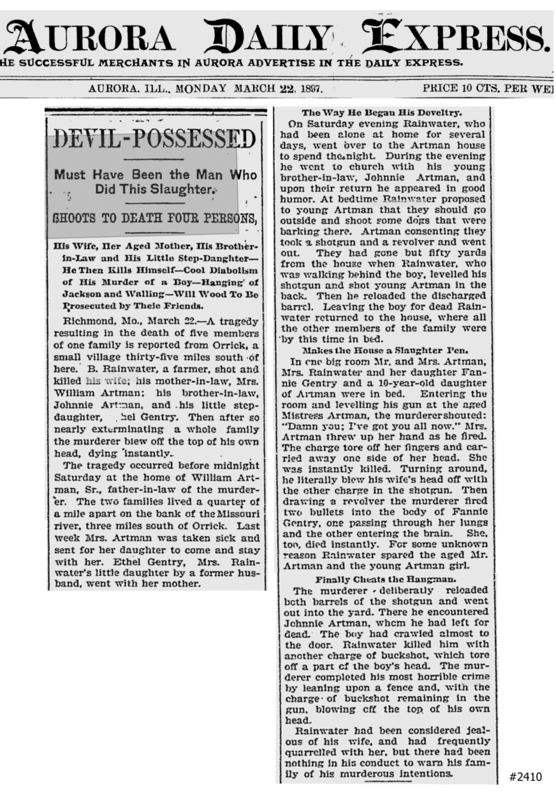 2424: "For the Pen", page 1, Daily Mail, Nevada, Vernon Co., MO, 18 Dec 1883, scan of original. Concerns Riley Rainwater's being sentenced to jail for bigamy. 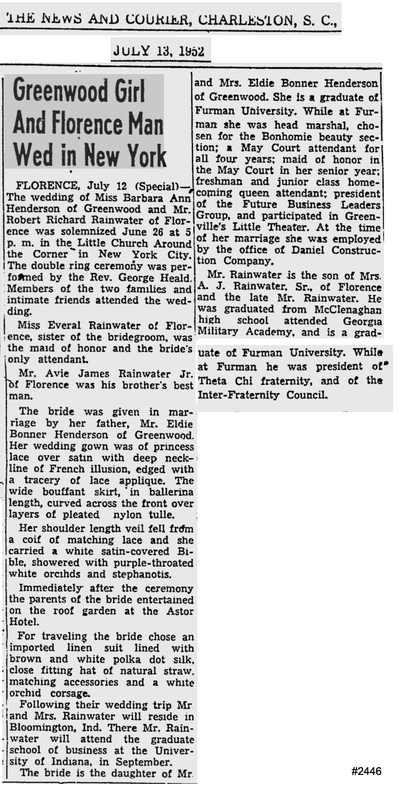 2446: "Greenwood girl to wed Florence man", The News and Courier, Charleston, SC, 13 Jul 1952, scan of original. 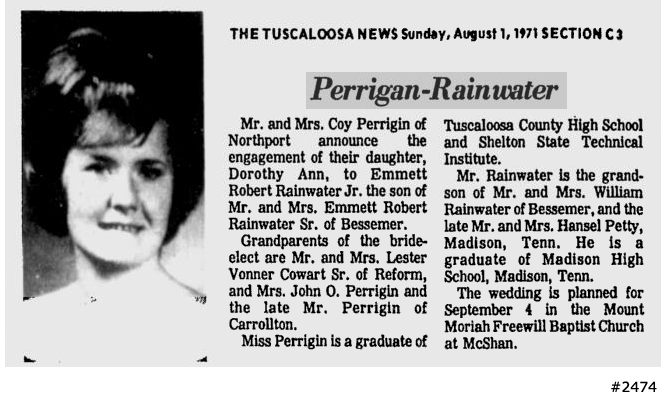 Wedding announcement of Robert Richard Rainwater and Barbara Ann Henderson. 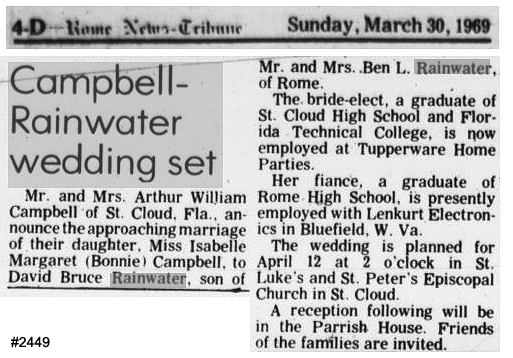 2449: "Campbell-Rainwater wedding set", page 4D, Rome News-Tribune, Rome, GA, 30 Mar 1969, scan of original. 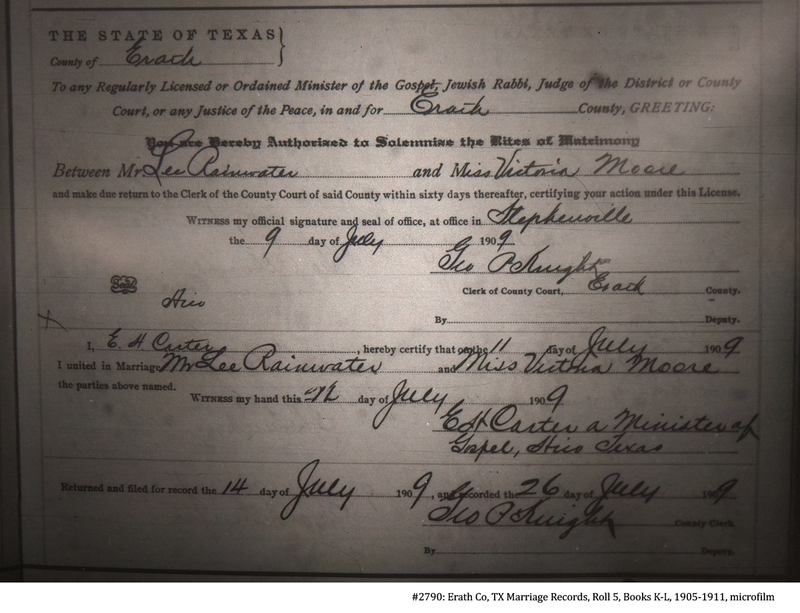 Wedding announcement of David Bruce Rainwater and Isabelle Margaret Campbell.